A gorgeous living room doesn’t have to cost a fortune. Don’t miss these budget decorating sources to help you get the look for less! Traditional modern – like awfully good, bitter sweet, or icy hot – is a contradiction in and of itself, I realize. But I’d like to think that the use of this oxymoron makes me neither an ox nor a moron (can anyone name that movie?! )… Rather, it recognizes the fact that good design is not trapped by categories. Just like yourself: you may be naturally relaxed, but you care fiercely for those you love. Or you may be brilliantly efficient and productive, but you slow down to savor the beautiful things of life. Good design does the same thing. One way that it does that is by balancing splurge items and budget pieces. Plus – let’s just be honest – very few of us can afford all the fancy things. 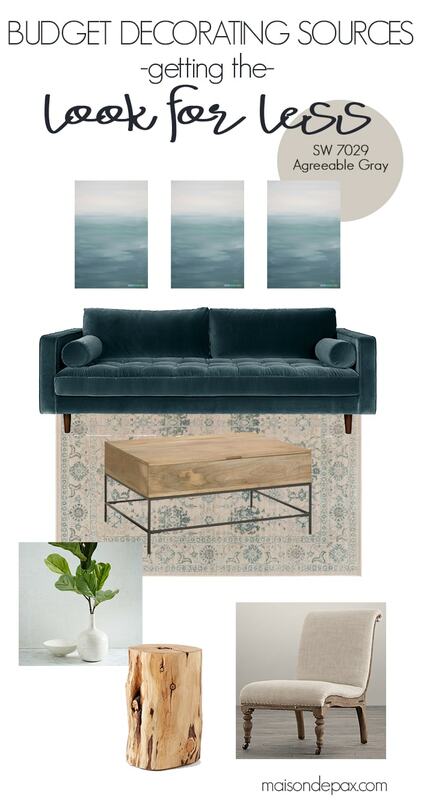 If you remember the design board I put together recently for my brother’s apartment, there were quite a few pricier items… and we all could use some budget decorating sources, right? So today I want to share with you some splurge/save options for this room. This post contains some affiliate links for your convenience. Click here to read my full disclosure policy. There are some really great budget options, aren’t there?! 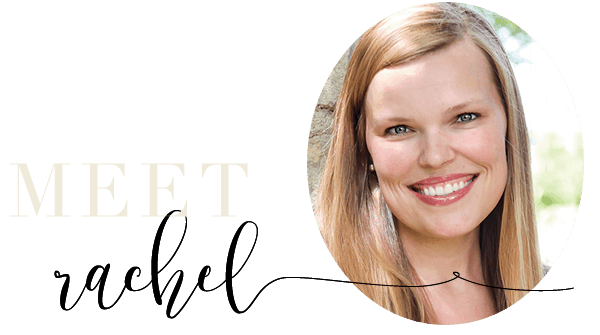 Now believe me when I say there have been seasons in my life when money was too tight even for the “budget items” listed, so please don’t miss hear me in this last question… But dream with me for a moment. 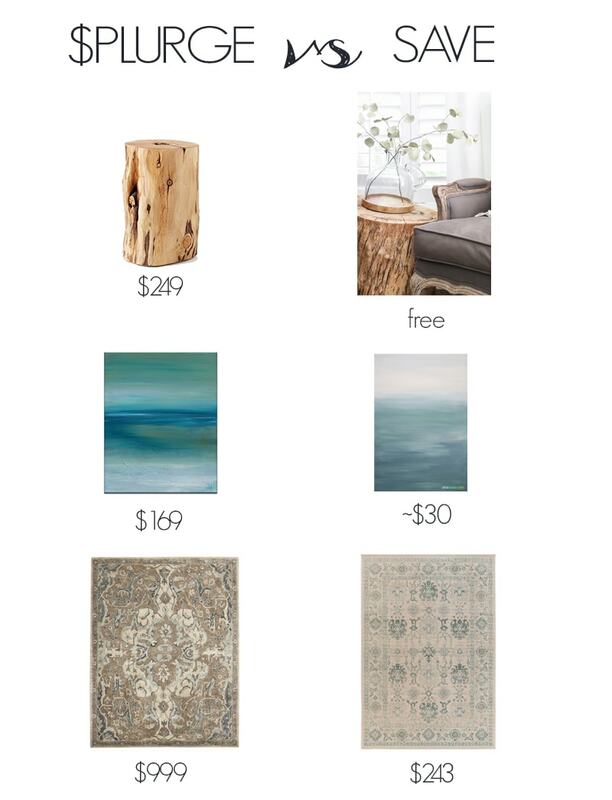 Assuming there is a least a little wiggle room, the fun part is deciding which is that item you want to splurge on. What do you think? Which one would you splurge on? And which one do you think my brother and I decided he should splurge on? I think it can be really hard to know when to splurge or when to save. We have recently decided that it is better to buy cheaper options and then upcycle them to make them much nicer by painting them etc. We splurged on sofas but I wished we hadn’t because our cats have scratched them! You are SO right, Jenny! It’s a tough balance for sure and one reason I love the DIY option. It also opens the doors for thrifted, vintage, and antique pieces when you can upcycle them to your tastes. So sorry to hear about those couches, though! 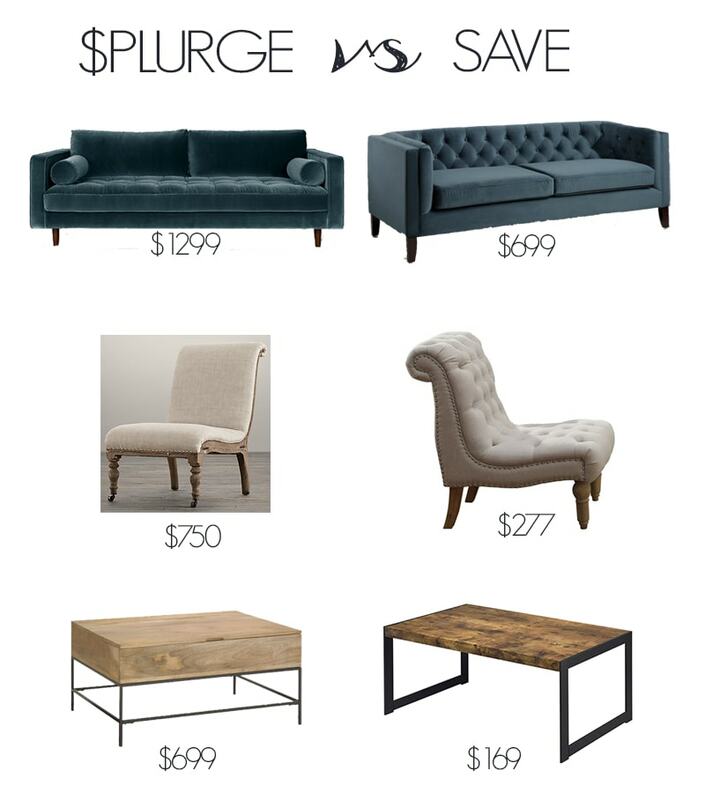 Although it’s all beautiful, I actually like the “save” items better than the “splurge ” items! I’m so glad to hear it, Leslie! How exciting!! I feel that comfort is left out of so many decorating equasions lately. I would want to sit on the couches and chairs before making any decision.